Greece referendum: Voters decide whether to accept bailout terms. 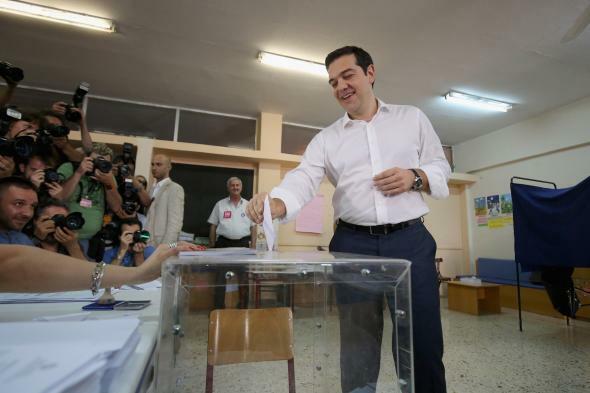 Greek Prime Minister Alexis Tsipras puts his referendum vote in the ballot box at a school in the suburbs of Athens on July 5, 2015. Update, 6:30 p.m.: Nearly all of the ballots have been counted in Greece and 61.32% of the votes have come in on the side of rejecting the austerity measures and tax increases demanded by Greece’s international creditors. For more on today’s referendum, check out Joshua Keating’s new post here. Update, 4:35 p.m.: The Ministry of the Interior’s official count now covers 85% of the vote, and the No side has crept up to 61.51% with 38.39% voting Yes. Statements of approval for the Greeks’ rejection of the bailout terms are coming in from not only domestic voices aligned with the Prime Minister, such as Greece’s Green Party, but from some voices abroad far politically removed from Tsipras’s liberal government. The leader of France’s right-wing National Front party, Marine Le Pen, released a statement calling for European countries to “take stock of the failure of the euro and austerity, and organize the dissolution of the single currency system, which is needed to get back to real growth, employment and debt reduction,” Reuters reports. In Britain, the result was praised by the leader of the anti-immigrant, anti-euro UK Independence Party, Nigel Farage. EU project is now dying. It’s fantastic to see the courage of the Greek people in the face of political and economic bullying from Brussels. Update, 3:25 p.m.: With victory all but assured for his No campaign, Greek Prime Minister Alexis Tsipras is reportedly calling other European leaders, including French President Francois Hollande. There is no confirmation yet that Tsipras has reached out to German Chancellor Angela Merkel, arguably the face of the pro-austerity push for Greece. BBC’s Berlin correspondent suggests that Greece’s No vote could lead to political trouble for Merkel at home. Update, 2:35 p.m.: Celebrations have begun for “Oxi” supporters as official results continue to show an overwhelming victory for their No campaign. Update, 2:15 p.m.: The Guardian reports that the Ministry of the Interior has released an official projection with a little less than a third of the vote counted. The government predicts that final results will put the No vote at 61% of the total. Update, 1:55 p.m.: With about one-quarter of the vote counted, the No side has maintained a steady lead of about 20 points. The latest numbers from the official government page stand at 60.55% to 39.45%. Update, 1:22 p.m.: The first results have been posted by Greece’s Ministry of the Interior. Covering approximately 12.7% of the vote, the totals show No ahead at 60.09% and 39.91% on the Yes side. Original post, 12:27 p.m.: Greek voters went to the polls Sunday to decide whether to accept bailout terms imposed by international creditors. Prime Minister Alexis Tsipras is calling for a “No” vote to reject harsh austerity measures, which would almost certainly lead to Greece’s exit from the Euro zone. A “Yes” vote would make continued aid more likely, though a previous offer from creditors might not be available after Greece missed a payment on its debt last week. The polls closed at 7:00 p.m. local time (noon EDT). While exit polling seems to be sparse to nonexistent, the BBC is citing late polls that show a narrow victory for the no side. The BBC also reports that French President Francois Hollande and German Chancellor Angela Merkel are planning to meet in Paris on Monday morning. Read more Slate coverage of the Greek financial crisis.